Welcome to this "first week" of September. I resurrect this photograph from the archives—as it seems so appropriate. Although the stars have not alerted me in advance, I have witnessed and listened...and heard: "conflict." 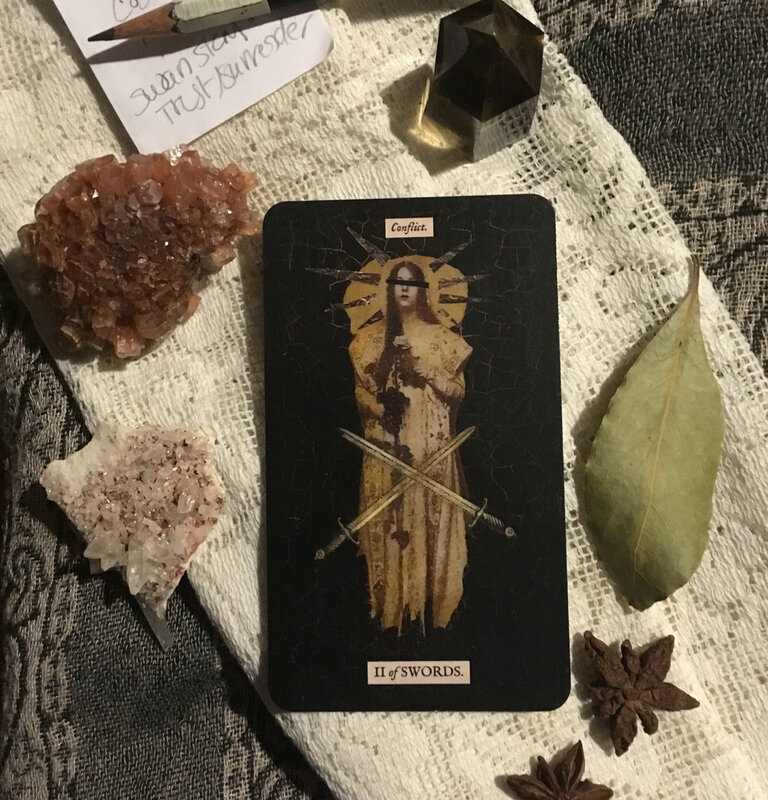 The Two of Swords (pictured from the Stretch Tarot by Jo Stretch) is about choice, blindness, pause, waiting, illusory obstacles, hesitation, lack of clarity and hazy-fuzzy-ness (and so much more...BUT...). I hear stress: I hear conflict in decision making. I hear "I am a destined to let someone or some party down." When you consider your choices and options this week, sit first...still. Back up. Breathe. When you think "Bobby's base-ball game or Ruth-anne's birthday gathering!?!? !," remember that it is alright to choose just one. It is natural to want to do all, both and everything. It is unnatural to actually do that. :) Right????? Life is full of choices, and right now, there seems to be a buzz about: too many offerings. It's as if the Seven of Cups is stalking about and just won't relent. But conjure up Temperance; tap into your inner Hermit; regard your High Priest(ess) for all she/he knows and does. Acknowledge that the wise ones among us do what we do with whole heart...and send blessings along to the rest. Know you are loved. Know you are strong. Tap into your knowing and do not waver (if possible). The weak foundation is most likely to crack.